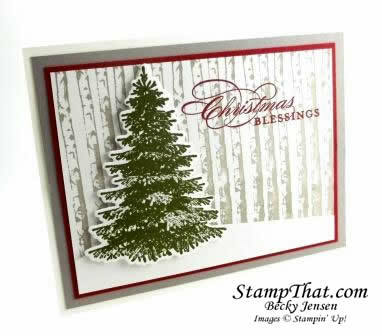 The Winter Woods Stamp of the Month class is on Tuesday. This is such a pretty set! It makes some beautiful Christmas cards, but it really can be used all year long. This is a great masculine set as well. Of course the dies enhance the stamp set amazingly! This set does not have any sentiment stamps in it, so I pulled out a retired sentiment to use here. I just can’t resist that swirl! I look forward to seeing a number of you in class on Tuesday as we catch up on several classes.